Riding around Charlotte with George South is like being on a guided bus tour of famous wrestling-related landmarks for Jim Crockett Promotions. Not just the more obvious significant sites like the Park Center or the location of the Crockett offices on Briarbend Drive. The smallest detail, the places and things that might seem insignificant to others, are the things that are often the most special to George. So off we go. We’re on a tight schedule, we’ve only got an hour or so before we go pick up the Sotos and El Reyo when they get out of school. 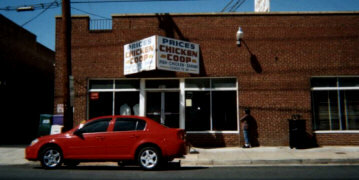 Just enough time to make my first visit to another Crockett landmark, Charlotte’s world famous Chicken Coop. 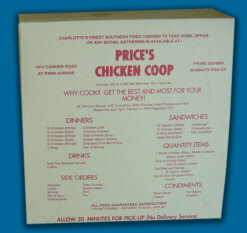 Price’s Chicken Coop has been written up in national magazines and featured on television all over the country. (See a special video on the Turner South website.) It fits the description of hole-in-the-wall. The Chicken Coop has to look just like it did 30 years ago, which is pretty amazing given it’s smack in the middle of Charlotte’s trendy fast growing up-scale South End district, just south of the downtown financial center, blocks from the Panther’s NFL stadium and the new NBA basketball arena. But the yuppies and movers and shakers haven’t changed this special place, a step back in time, and the best fried chicken I think I've ever had. That covers some territory for me. 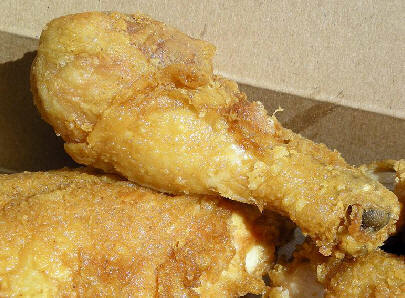 I’m already a fried chicken or two over my limit for a lifetime. This is starting to sound like a restaurant review, so I’ll stop here. I'll leave it at this: my first bite of Price’s Chicken Coop chicken and I was taken back 30 years ago to my grandmother Nana’s kitchen at her cabin on Lake Summit, in North Carolina. She pan-fried the chicken, of course. That was the best fried chicken I’d ever had, until now. I’m not going to say Mr. Price does it better than Nana, but let’s just say Nana and Mr. Price would have gotten along pretty well. 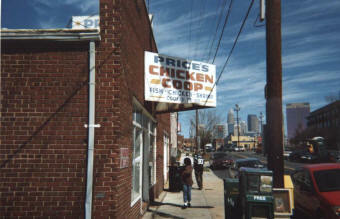 Price's Chicken Coop on Camden Road, Charlotte's skyline in the background. Now what does all this have to do with Jim Crockett Promotions and Mid-Atlantic Wrestling? “You ain’t seen nothing until you see Tully Blanchard in a three piece suit, diamond rings and shades, digging into a box of chicken from the Chicken Coop”, George tells me. Beginning in the early-to-mid 1980s, after the main TV tapings had moved from the studio to the arenas, Crockett would tape the local promos for each town at a small make-shift studio at the Briarbend Drive office during the day on Tuesdays or Wednesdays, rushing to get done so everyone can head out to whatever town they were running that night. It was a non-stop taping marathon that lasted sometimes as many as eight hours, and during that time, the wrestlers couldn’t leave. But what about George? Surely he didn't get left out. Of course, if the chicken cost $20, George made ten times that in tips form the boys. Price’s chicken is take-out only. So there we are, George and I sitting in his car, Journey on the radio, 70 degrees, sunny blue skies, prettiest day of the year so far. We’re slamming down the fried chicken, hush puppies and sweet tea as fast as we can. We ran out of napkins, I had to wipe my fingers on a Texaco road map. Best fried chicken I’ve ever had in my life. And of course, we had to drive by the old Crockett office location and reminisce. Those days are gone forever, I guess we should just let ’em go. I’m going to get out my old 1985 wrestling tapes, maybe I’ll spot a small greasy spot on Tully Blanchard’s tie while he’s cutting one of those promos. I’ll know then that George has just made a run to the Coop. Was down in Charlotte this past weekend for a two day martial arts seminar. Had the pleasure of checking out Price’s Chicken Coop. Wow!!! Best fried chicken I’ve ever had. Service was awesome also. Extremely fast, especially considering how busy they were. I’m glad I got the chance to go there. Thanks for including that little piece of MACW history (and Charlotte history for that matter) on your awesome web page. Keep up the great work fellas! Long live MACW and JCP!!!. PS. Forgot to mention what a nice city Charlotte is. Hope to see that again in the near future. from Southern Living's "The South's best Fried Chicken"
There's nothing fancy about this restaurant. In fact, there's not even a place to sit down and enjoy your meal, but we sure got lots of letters singing the praises of Price's. One reader even went so far as to visit www.mapquest.com and print out directions for us to follow. Still, I was skeptical. The lunch counter occupies a simple redbrick building in the shadow of downtown Charlotte. I arrive at three o'clock in the afternoon only to find a line trailing out the door. At lunchtime, it is not unusual for the line to stretch around the block. Once inside, I realize that this is no feel-good, what-can-I-get-you-honey kind of establishment. The white cinder block walls are unadorned. A hand-lettered menu hangs above a long white counter where a half-dozen cashiers buzz around taking and filling orders. Behind them, white-jacketed fry cooks stand over bubbling vats of hot oil, cooking chicken as fast as they can. Maybe it's the anticipation that makes it taste so good, but it's all I can do to make it to the parking lot before ripping into the flat white box. All around me, others sit in their cars, radios and air conditioners blasting, delving into their own boxes filled with tater rounds, mayonnaise-based slaw, feather-light hush puppies, and scorch-your-fingers hot chicken. Price's opened in 1962 to cater to blue-collar workers in the area who had only 30 minutes for lunch. Little has changed, except now it's as popular with downtown businesspeople as it is with construction and factory workers. 1614 Camden Road, Charlotte; (704) 333-9866. Half-chicken dinner: $6.10. 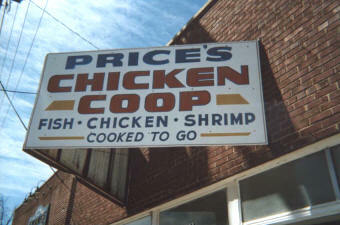 Price's Chicken Coop, 1614 Camden Road, sure isn't much on the eyes -- but when it comes to fried chicken and seafood, you've hit pay dirt! The small brick building near downtown Charlotte serves only take-out. The lack of fancy digs, however doesn't seem to make much difference to long-time devotees of the legendary eatery. It's a regular thing during lunch for a line of hungry customers to snake its way out the door and onto the sidewalk. Luckily, the service is very quick. Price's opened in 1962 under the direction of Talmadge Price. The following year, the head cook Edward Garritt came on board, and he's still with the company today. According to Talmadge's son Steve, who continues to run the eatery, the business originally opened to feed the workers of a nearby factory -- one that has long since vanished into the pages of Charlotte history. The restaurant, however, has outlasted many of its neighbors. "Our original intention," Steve explains, "was to feed the working class. Give "em a good meal quick and get "em on their way. Now everybody comes here." 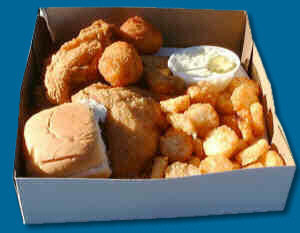 Bigwigs like Charlotte Mayor Pat McCrory and former Mayor Harvey Gantt stop by on a regular basis to stand toe-to-toe with the regular folk -- all waiting in line for The Coop's legendary fried fish and chicken, served up with a side of slaw, potato salad or an order of hush puppies. Folks at Creative Loafing who remember their old offices say the one thing they miss the most about the former location is its nearness to Price's. A couple of Loafers got a dreamy look and one appeared to start drooling when the eatery's fried chicken was brought up. The secret to Price's longtime success? Price has a quick, ready answer: "We always try to be consistent."